During this time of year we are experiencing many landscaping “crimes”. I see it all over Gainesville, Florida. In our neighborhoods, local businesses, and even on city and county properties. Many people have unfortunately turned the other way or just do not realize it is even happening. This is a major pet peeve of mine, and hopefully after reading this blog you may be able to help reduce this hideous crime. The Crape Myrtle, or the “Lilac of the south, is a native of China. It is one of, if not the, most popular flowering tree in the south. It was introduced to the United States around 1786 by a man named Andre Michaux. Some of the reasons it has became so popular is because it is tough, adaptable, can take the Florida heat, is pest resistant, requires minimal watering if at all, bloom all summer long (about 100 days), have many color options available, and can be self maintaining if you choose to not trim them at all. Unfortunately, here in Gainesville, homeowners, and many “landscapers” have gotten in the habit of “murdering” them by cutting them WAY too short. This time of year (Late Winter) is the optimal time of year to prune Crape Myrtles, but the purpose is to create a canopy in which air can circulate, so all branches can receive light. 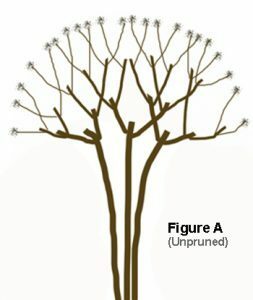 If one does prune a Crape too severely, commonly called “Crape Murder”, it can be extremely damaging to the tree, and may cause a deformity of it as well. 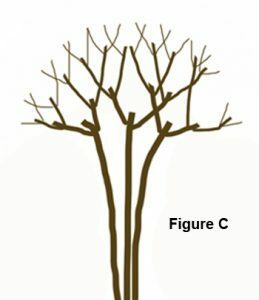 Remove suckers, or saplings, from the bottom of the plant. 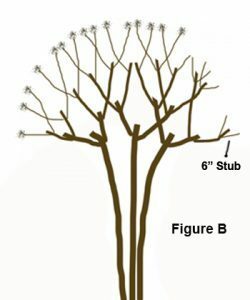 Remove any crossed, damaged, or diseased branches. Thin out any small “twiggy” growth to allow better air flow. If you have trimmed your Crapes too far in the past, do not worry! They are very hardy and will most likely come back just fine. My hopes are to help educate everyone on this topic so we can all work together to continue to beautify Gainesville and save the trees! To watch a video showing how to properly trim a Crape Myrtle, please watch the video I created by clicking here. If you need any assistance with maintaining your lawn or need some landscaping assistance, please let me know.